A good man, wrote Flannery O’Connor, is hard to find. Years ago, before reading her so-titled short story, I’d wrongly assumed it was in reference to uncompromising high standards in a partner. For single women, above all others, still have these. Especially those of a religious bent and who keep peacocks as pets. O’Connor may as well have said her rosary with a dozen cats. But that wasn’t her meaning, it turns out. To some (aka CliffsNotes, Wikipedia, your college English professor), the theme is redemption. However, to me, it’s the high-irony of a grandmother lamenting the loss of the good old days while displaying the very qualities she vocally lothes. Folks just aren’t nice like they used to be. No respect, manners, decency (she says as she judges and demeans others). Now you’ve got to lock your front door and people want nothing but money when they call you on the phone. Just slip an envelope under the front-door mat, grandma. However, what the old woman in this story thought was “good” got skewed, affected by what was good for her. Often that’s the case, our moral compass contorts from outside in, to what’s the best for us. “She would of been a good woman,” O’Connor wrote, if there “had been somebody there to shoot her every minute of her life.” Someone to keep her in check. Selfishness runs amok in self-pity. Recently, I visited my favorite bass pond for the first time this season. 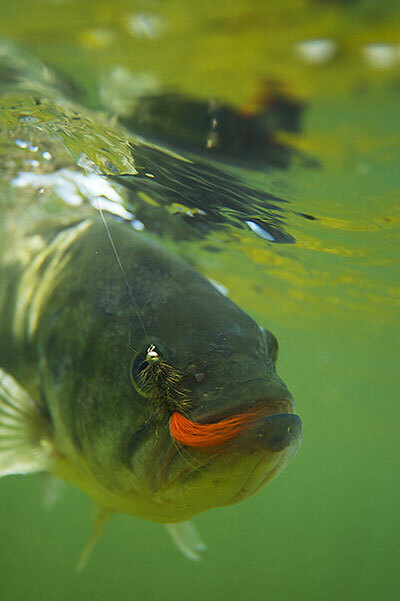 A Scrooge-nightcap-shaped water, it houses healthy and big bass and sits unnamed on public land. I’ve never seen another angler there, just dog-walkers and Ironmen-in-training. That day, I was met with new fencing on both sides of the pond, running into the water for good measure, and signed No Entry Beyond This Point. Raptor Nesting, they read. The dammed east-end was still open though, where the trail crosses over and people pass, and where it would be a nearly impossible cast to where I know the big bass bunk down and feed. It was still something though, still public access warmwater. Still fishable, in part. I should have been relieved, happy like a guest with whatever was served. But I admit, I wasn’t. Although I try to be polite about such things, my mother has always said my face betrays me, shows what I’m thinking like a muddy puddle does the sky. I grew increasingly annoyed, answering “catchin’ anythings” from every person who passed. At least on the side banks, I could delight in avoidance, and if dressed in olive drab, be hardly, if ever, seen. For the most part, folks keep their eyes on the trail. My head ran venting lines about rules, regulations, closures. About how hard it is to find public access for warmwaters where the bass aren’t illegally taken out by the bucketfull. How the treatment of this pond as a gigantic swimming pool for dogs probably did more harm to the ecosystem than a few anglers stalking the banks. And I wondered what species of raptors were nesting. I’m familiar with these sorts of closures, usually around crags and cliffs. But flatland marsh and cattle pastures? An older gentleman walked behind me on the path. Wearing a fanny pack and straw sunhat, binoculars hanging from his neck by red bootlace (probably from his “backpacking days” in college, isn’t it always), it was obvious he was a birder. He asked about the catching. I cringed, nothing much. He smiled and continued talking—surprisingly, about the closure. Turns out he was a volunteer for the county and was monitoring northern harrier hawks. Nesting on the ground, their eggs and chicks are easy dinners for raccoons, fox, and coyotes. And as marshland has been eaten up by development, breeding grounds have decreased each year, as have their population numbers. But this year, a pair had taken up residence in the cattails on the far west side of the unnamed nightcap pond. Big stuff! Great news! If I’d been O’Connor’s grandmother character right then, the Gentleman Birder would’ve been the one to fire the shot and set me to rights. Oh, that’s right: You’re being a self-centered terrible human being, Erin Block. I’m a pro at self-beration. Along with other anglers and recreationists, we share our waters with a host of birds and small and large mammals. Even carnivores. As Aldo Leopold wrote, homo sapiens need to get over themselves [my words, of course] and move from “from conqueror of the land-community to plain member and citizen of it.” Primus inter pares. Equal among equals. We watched as the male northern harrier flew above the reeds, low in swoops, starts and stops. To get the female’s attention, Gentleman Birder explained. Soon she popped up and grabbed whatever it was he’d brought. A fieldmouse, probably. Maybe a small bull snake.